Weston provided emergency response services to support a hazardous materials release and warehouse fire in Texas. 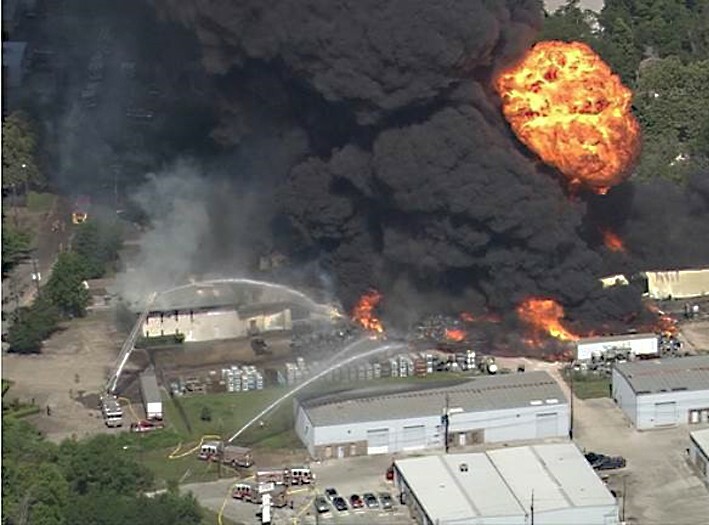 The Houston Fire Department (HFD) responded to a 4-alarm fire at a warehouse facility suspected to contain many unknown chemicals, including fuel additives, pesticides, and herbicides in a densely populated area of the city. Water runoff generated during the firefighting response entered on-site stormwater inlets and a local unnamed tributary, which then flowed into Spring Branch Creek, and impacted approximately 3 miles of the waterway. As the fire spread, the EPA reported a release of an ignitable mixture of petroleum and hazardous waste products to the air, soil, and waterways between the facility and the intersection of Spring Branch and Memorial Drive. That same day, Weston responded to the emergency and seamlessly integrated with the incident’s Unified Command structure to support EPA. Activities performed included air monitoring, sediment and water sampling, and working with multiple agencies under both CERCLA and the Oil Pollution Act (OPA) regulations. Containment and adsorbent booms were deployed in several locations along Spring Branch Creek to restrict the flow of contaminants from advancing past the final boom at Memorial Drive. For 3 months, the Unified Command continued to monitor the cleanup activities at the site. The responsible party contractor conducted the removal of wastes, products, and stormwater generated in rain events. Throughout this stage of the response, Weston assisted EPA and Texas Commission on Environmental Quality (TCEQ) in ongoing sampling events, and collecting soil samples from impacted residential properties, roadside ditches, and sediment samples from Spring Branch Creek. During the project, EPA and Weston coordinated with multiple agencies. In response to public concern from residents living along Spring Branch Creek, Weston collected sediment samples from locations along visually impacted sections of the creek. The sampling event was conducted after residents raised concerns regarding remaining unknown impacts on the sediments from the chemical release during the fire. The sample results determined that no exceedances of hazardous materials remained in the creek that were attributed to the warehouse fire. Throughout this 3-month effort, Weston was able to provide air monitoring and multi-media sampling to ensure the safety of nearby residents and minimize impacts to neighboring surface water bodies and downstream environments.